“I was born in Independent Lithuania, and I want to live and die in a free country rather than the Soviet Union.” With such powerful and optimistic words, the Lithuanian composer Vytautas Barkauskas became the voice during the 1990’s for the ideals and hopes in his country, still under the flag of the then collapsing Soviet Empire. It was with such a spirit that the composer translated into music the turmoil and expectation that a whole nation shared. 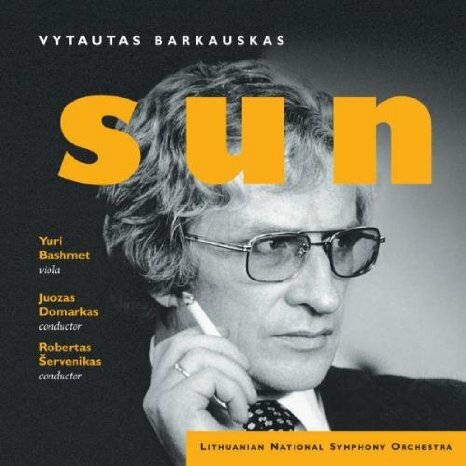 ‘Sun’ marks the awaited return of Barkauskas to Avie, this time featuring acclaimed viola player Yuri Bashmet to whom Barkaskas dedicated his Viola Concerto. Other works here include the symphonic picture Sun, Symphony No. 5, and Konzertstück No. 2, all composed between 1981 and the mid 1990’s. The music of Barkauskas speaks about the spiritual world of the individual and the artist in his struggle with the conditions of all human fate. Enriched with the composer”s ability to express rhythmic and harmonic patterns that are a complex mixture of his own traditional musical vocabulary and the new more western feel of classical and modern styles of composition, these works reflect the hope of the his homeland as it comes closer to its eventual independence. Vytautas Barkaskas was born in Lithuania in 1931 and is Professor Of Composition at the Lithuanian Academy of Music where he has taught since 1961.